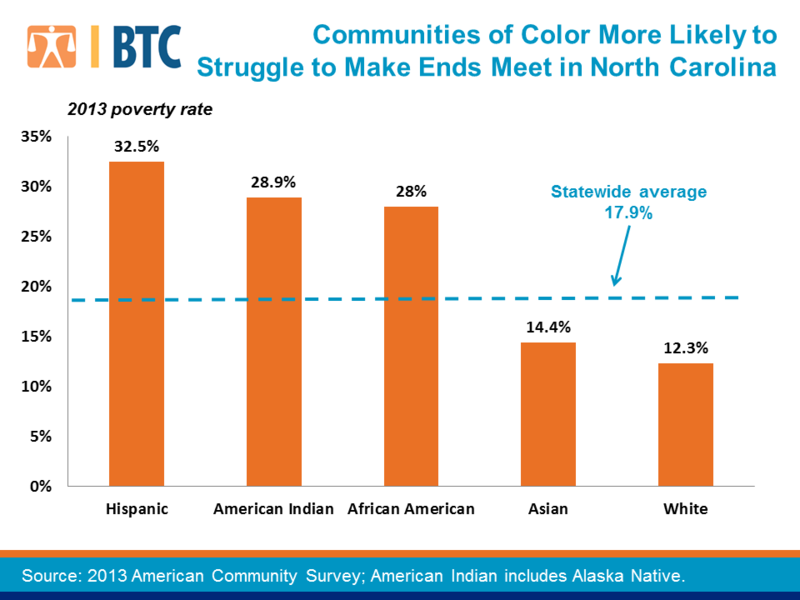 The number of non-Hispanic whites living in poverty is greater than any other group in North Carolina. At the same time, some communities of color are much more likely to live on the brink, earning an income that puts them below the federal poverty line. In 2013, 32.5 percent of Latinos, 28.9 percent of American Indians, and 28 percent of African Americans lived in poverty compared to 14.4 percent for Asians and 12.3 percent of non-Hispanic whites (see chart below). Poverty has grown for all groups since the recession, with Hispanics and African Americans experiencing the biggest jumps in economic hardship. Communities of color have historically been more likely to live on the brink than whites due to a lack of access to jobs and an earnings gap, a legacy of slavery and discrimination, and a lack of equity in public and private investments in certain communities. Other previous policy decisions—such as government-sanctioned redlining in the housing market and the initial exclusion of people of color from the GI bill—also resulted in fewer pathways to the middle class for communities of color. The Great Recession exacerbated the entrenched racial disparities in economic hardship. As racial groups continue to experience very different economic realities, it is important to reverse these troubling trends. North Carolina can do more to do more to ensure that struggling people and families—across all racial groups—can step up and out of poverty. Raising the minimum-wage and reinstating the state’s Earned Income Tax Credit are two critical policies to help working families achieve economic security. Together, these policies ensure that working families are maximizing their take-home pay and better able to make ends meet. For more policy solutions see the North Carolina Justice Center’s new 2014 State of Working North Carolina report, which lays out a policy agenda that will help reverse decades of inequality and create pathways to opportunity for all North Carolinians. This is the second post in a series that takes a detailed look at the 2013 US Census Bureau poverty data released on September 18th. The first post that looks at how North Carolina is faring overall is here. Read the entire series here.